Torrance: “You cannot make changes at 40 in golf"
Padraig Harrington and caddie Ronan Flood in Killarney. Who will be next to go in Harrington’s back-room team? Photo Fran Caffrey/www.golffile.ieBob Torrance reckons Padraig Harrington is on a road to nowhere and won’t win again until he turns back. The veteran Scot, 79, insists that the Dubliner is “crazy” to make changes in his swing as he prepares to turn 40 at the end of this month. “Disappointed” that Harrington has decided to “take a break” in their 15-year partnership, Torrance said: “He has been going down one road that I think is the wrong one and he is determined to go down that road. “I said to him, if you go down too far, you won’t come back. “You cannot make changes at 40 in golf. You can make them when you are in your 20’s, but once you get to 40, it is too late. Torrance rebuilt Harrington’s swing from the ground up, helping him win three majors and another 19 titles worldwide. And he’s amazed that the Irish ace is adamant about making changes in his swing that have only led to a slide from third to 64th in the world. Believing the will talk again in three weeks, Torrance said: “I think it’s crazy. He is as high as he can go in golf. He won two Opens in a row and then he won the USPGA. He has won tournaments all over the world. “He just said he needed a break for three weeks, to see if I can clear my mind up. Will we meet again? Hopefully - some sunny day. While some describe Harrington as “eccentric”, Torrance said: “Padraig is not a strange man, he has just got his own ideas. Nothing will shift him. Once he gets onto that, that’s that. “His game is in bad shape because of his mind, not because of his golf. I’ve said that and he agrees. That’s why he wants away. The Dubliner said on Friday that he needed to make changes but ruled out sacking members of his back-room team. But after sleeping on his sixth missed cut of the season, he spoke with Torrance on Saturday morning and they decided to separate for the time being. Harrington said: “We are frustrated. There is no doubt about it. We always had a good argument. But at the moment there is less arguing, there is just more frustration and tension rather than getting it out there. “I think it comes down to the fact that I want to spend more time working on my mental game and my short game that necessarily beating balls, which I would have done earlier on in my career. Harrington is now believed to be contemplating making further changes and it remains to been seen if caddie and brother-in-law Ronan Flood or mental coach Dr Bob Rotella will be next to go. Harrington admitted that it was painful to break up but he left the door open for a reunion while he explores other avenues. He said: “Bob has been unbelievably important in my career and he has completely shaped it. Torrance admitted that the pair have been at loggerheads for several years and described their relationship as being a father-son affair. He said: “He’s like a son to me. We changed everything in his swing from the top of the swing to the start of the swing, through the ball. We spent nine hours on the practice ground ever day he was over in the rain, the snow, the hail. Goods news for Harrington fans still recovering from this season's swing change slump. Padraig Harrington is bringing Bob Torrance to the Titleist Performance Institute in December. While the Dubliner claims that he doesn't need or want to see Bob Torrance while he is at tournaments, his long absence from Europe at the start of the season and his confusion over the side effects brought about by a swing change run wild, culminated in his worst run of form for 13 years. Turnberry 2009One of the most revealing moments of the season came at the Open in July, when Torrance and Harrington spent hours doing remedial work on the range. It was effectively the start of a new season. Harrington honed his neglected short game, cleared his mind of swing change confusion and the results have been stunning. So what the hell happened from December to late July? Can Padraig Harrington emerge from the wilderness any time soon?Bob Torrance will jet in to Dublin later this week hoping his expert eye will find a solution and arrest Padraig Harrington’s freefall to 41st in the latest world rankings. Harrington and Torrance work on his swing at Turnberry in 2009. They didn’t see eye to eye then and still don’t.A desperate Padraig Harrington made one of the toughest decisions of his career in Killarney yesterday when he decided to part company with veteran coach Bob Torrance. The frustrated three-time major winner, 39, has slumped from third to 64th in the world since his US PGA win three years ago, suffering his sixth missed cut of the season in this week’s Irish Open. He admitted on Friday that he needed to make changes but ruled out sacking members of his back up team. But within 24 hours the architect of his success was out in the cold - Harrington says temporarily - and wondering what had just happened. Harrington "doesn't want to know"
Padraig Harrington uses the Flightscope under the watchful eye of his caddie and a representative of Wilson Golf at Firestone. Picture by Fran Caffrey/www.golffile.ieIf a change is as good as a rest then Padraig Harrington can expect to mount a challenge for the WGC-Bridgestone Invitational at Firestone Country Club exactly two years after he finished second to Tiger Woods in a thrilling finish. That said, the Dubliner has no intention of heeding the grave warnings pronounced by his currently estranged coach Bob Torrance following their decision to “take a break” in their 14-year relationship at last week’s Irish Open. Once Harrington made the split public when asked about it on the driving range in Killarney last week, Torrance explained exactly why the pair have not seen eye to eye for some time. Back in the good old days. 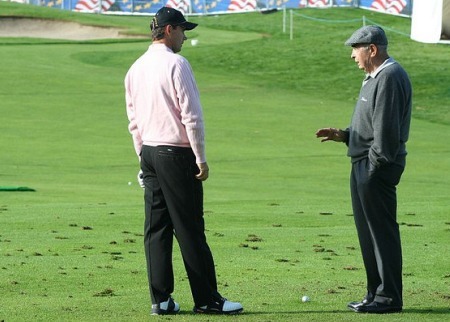 Harrington and Torrance at home on the range. Picture courtesy Richard Boyle.When Padraig Harrington sacked longtime coach Bob Torrance in Killarney 11 months ago, bringing a 15-year father-son style relationship to a shuddering halt, he tried to explain why.